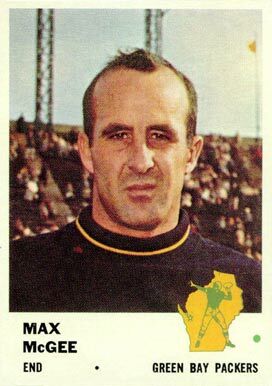 1961 Fleer football card of former Green Bay Packer split end Max McGee, who played 11 seasons, over a 13 year period from 1954 to 1967, missing the ’55 and ’56 seasons while serving as a pilot in the Air Force. He was the team’s punter early in his career, but saw more time as a receiver after Vince Lombardi took over as coach in 1959. He was a two-time Pro Bowler and a member of 5 Packer championship teams. McGee suffered from Alzheimer’s disease late in life, and died from injuries he sustained from a fall from the roof of his home, while using a leaf blower to remove leaves, in 2007 at the age of 75.